Hi, thinking of defecting from kombis and buying my first 500! Still prefer all the old original cars against the new but it looks great! 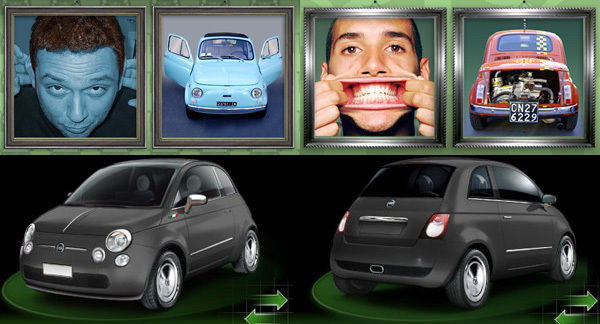 have u seen in the official website www.fiat500.com how u can personalised your car??? ?it will be very difficoult, after the 15th september, see 2 new fiat 500 similar.. wow!!!!!!!!!!!!!!!!!!!!!! !It’s an unbelievible revisitation of the old 500…they say it will be ready on the 15th sept..in the official website www.fiat500.com they present the car and create amusing competions..like pimp your own version of the 500, sing jingles..take a look!! Yes, is a very Mini-like operation… in last years Fiat don’t create great products, but copy its from others.